Facebook++ is a tweaked version of Facebook that provides you a lot of power in a single app; to see “most recent” feeds, download offline videos and much more. The sole purpose of creating Facebook++ was to provide a rich user experience, where the user can use Facebook in its own way, without having any restrictions on Facebook’s terms and policies. In-App Messenger – You no longer have to download a separate messenger app to have a conversation with your Facebook friends. Send unlimited photos in messages, with no restriction of sending more than 6 photos, as per original Facebook policy. Disable VoIP – Not everyone needs a VoIP in their message app, but Facebook still added it and it was draining a lot of battery life. But say bye to this restriction in Facebook++. Set Passcode – Now users can have a password protected startup screen, allowing it to be secure against strangers. Full-Screen Mode – You may now hide everything else on the screen while scrolling through your news feeds. Employee Settings – This feature opens the gate for tons of hidden features and settings, that you may have always dreamt of while using a regular Facebook app. Disable Video AutoPlay – Now you can easily disable the annoying video autoplay feature while scrolling through your news feeds. 1. If you have ever followed these procedures for downloading such tweaked apps on your devices without jailbreak, you may understand that you need to sideload the IPA of the applications from a different storage location to your device. 2. Once you go to the above webpage link, click on Download ‘Facebook++ IPA’. Tap on the ‘Install’ button from the popup box shown. 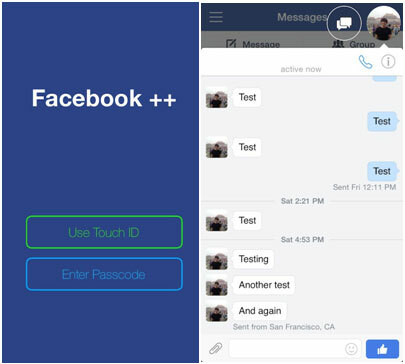 3.The above steps will successfully download the Facebook++ app on your iOS device. 4. Next step is to authorize the developer profile of Facebook++ app. Then Go to Settings à General à Profiles or Device Management (depending on the iOS version using). 5.Under Enterprise App section, tap on the developer profile to authorize. It will again ask you to tap on ‘Trust’ button. That’s it. You now have the power of all Facebook’s extended features on your iOS device. You have now successfully downloaded Facebook++ app on your iOS device. Go to the home screen to open Facebook++ app and you are all set to explore the unimaginable features and extended settings of this amazing app. The biggest advantage of this is that now you can have all that power in your hand without even doing a jailbreak on your iOS device.